Sheet size 11" x 9"
These quality paper towel rolls are strong and absorbent and a great economical alternative to more expensive name brand roll towels. Boardwalk 2-ply perforated towels are perfect for any home or business owner looking to save money without losing quality. Environmentally safe, while still providing softness and absorbency, these paper towels are made from 100% recycled materials. 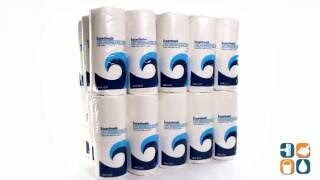 Boardwalk paper towel rolls are ideal for commercial, residential or industrial environments. Each Carton comes with 30 rolls of paper towels, so you can stock up and still stick to your budget. Got my product very quick and very pleased with my items I ordered. It does the job, and ships fast! First time ordering this product, 1 ply paper towels generic brand quality. We use the products for supplying vacation homes. The quality and price is reason for the purchase. Guest preparation for vacation condos- Good quality for the value and needs. These are 'bargain' towels, indeed. Your money is not wasted as long as you understand these are 'bargain' towels.